Remember the name Max Loughan, for you’ll likely hear it again and again in the years to come. The 13-year-old physicist is known for his eloquent theories on God, the universe, and the bible, and his lessons are sure to inspire some deep contemplation on life’s big questions. 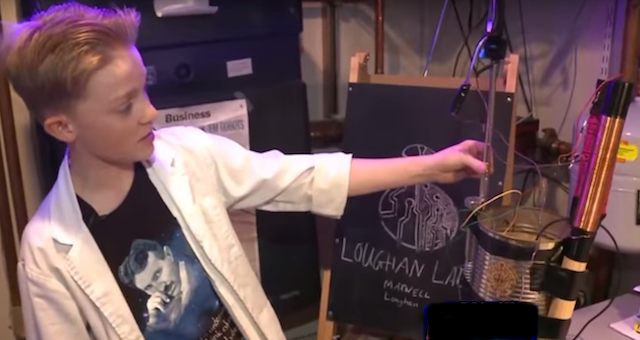 Not only did Loughan invent a free Tesla-inspired energy device using a coffee tin, spoon and wire (all of which cost him $15), he has developed some intriguing ideas on the universe. In the video below, he shares his latest theory on God, and it’s sure to touch your heart. “As cheesy as this sounds, from day one on this planet, I knew I was put here for a reason. And that reason is to invent and to bring the future. Quantum physicists already theorize that everything is energy and, in effect, all life is connected. Perhaps this kid is onto something!